Pork tenderloin is a lean cut of meat – tender and delicate – and, together with the pearl barley, it makes a very subtle bite. The cherry chutney, with its spicy and sour-sweet profile, enters to break the harmony on the palate. The wine plays here the role of mediator; with its great presence and body, it will incite the blend by adding structure and minerality. This is what would be called the perfect pairing, where the sum of the food and drink combination is more important than the sum of its parts. Malbec wine – 125 cc. Pearl barley – 250 g.
Vegetable stock – 750 cc. Chopped herbs (chives, coriander and parsley) – 15 g.
Olive oil – 30 cc. Clean the pork tenderloin fillets, add salt and pepper, and sear them in a very hot frying pan with a dash of olive oil. For the pork fillets to be tender, they should ideally be cooked to be juicy. Peel the carrots and then, with the help of a vegetable peeler, slice them thinly. Cook them for 1 minute in boiling water. Finish the cooking in ice water. Dry the carrot slices and fry them in olive oil. Cut the cherries in the middle and remove the stone. Using a gauze, wrap the spices and make a small bag. Bring all the ingredients to boil; then lower the heat, cover, and cook for 10 minutes or until properly reduced. Test its consistency by putting some on a cold plate. Sauté the chopped onion in the oil until it is translucent. Add the barley and cook for a few minutes; then add the boiling vegetable stock slowly until covering the barley. As the barley absorbs the liquid, continue adding more stock. Cook for 20 minutes. Finally, add the cream cheese and the herbs, and adjust the salt and pepper seasoning. 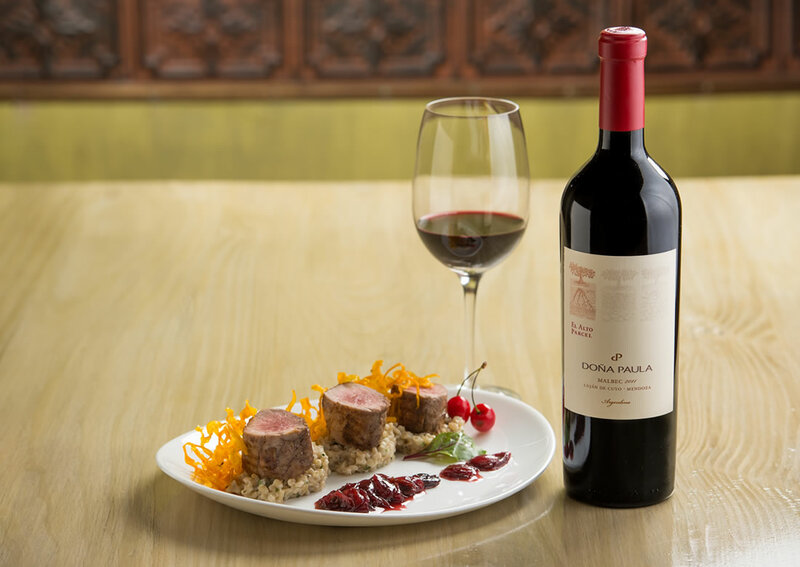 Serve the pork tenderloin fillets on a bed of barley, and accompany with the cherry chutney. Garnish with the carrot chips to add color and texture. We're very sorry. To browse our website, you need update your browser to Internet Explorer 10 or later. Also you can use another modern browser like Google Chrome or Mozilla Firefox. Lo sentimos, pero para navegar nuestro sitio es necesario que actualices tu navegador a Internet Explorer 10 o posterior. También puedes utilizar otro navegador moderno como Google Chrome o Mozilla Firefox.